The Doomsday Clock Is Reset: Closest To Midnight Since The 1950s : The Two-Way Criticizing President Trump, the Bulletin of the Atomic Scientists sees increased risk in dangers to humanity, from the proliferation of nuclear weapons to climate change. 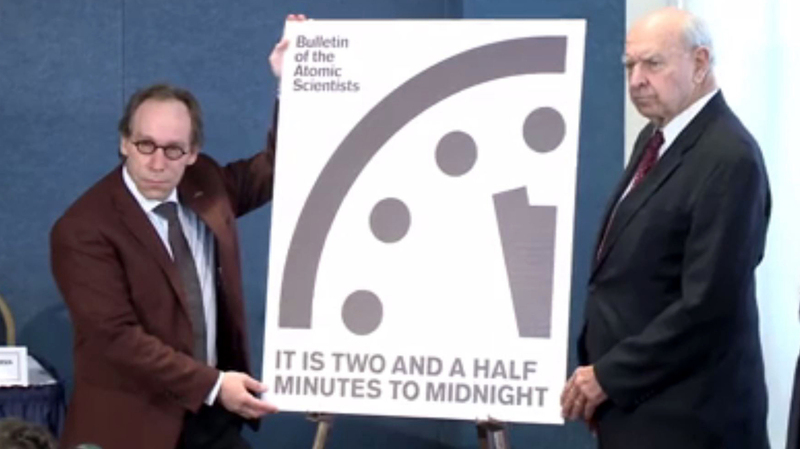 The minute hand on the Doomsday Clock ticked closer to midnight Thursday, as the Bulletin of the Atomic Scientists said it's seeing an increase in dangers to humanity, from climate change to nuclear warfare. The group took the "unprecedented" step of moving the clock 30 seconds closer to midnight, to leave it at 2 1/2 minutes away. The setting is the closest the symbolic clock has come to midnight since 1953, when scientists moved it to two minutes from midnight after seeing both the U.S. and the Soviet Union test hydrogen bombs. It remained at that mark until 1960. "Make no mistake, this has been a difficult year," Rachel Bronson, executive director and publisher of the Bulletin of the Atomic Scientists, said as the new setting was announced Thursday. "Over the course of 2016, the global security landscape darkened as the international community failed to come effectively to grips with humanity's most pressing existential threats, nuclear weapons and climate change ... This already-threatening world situation was the backdrop for a rise in strident nationalism worldwide in 2016, including in a U.S. presidential campaign during which the eventual victor, Donald Trump, made disturbing comments about the use and proliferation of nuclear weapons and expressed disbelief in the overwhelming scientific consensus on climate change." The board criticized President Trump further, saying that "even though he has just now taken office, the president's intemperate statements, lack of openness to expert advice, and questionable cabinet nominations have already made a bad international security situation worse." Last year, the Doomsday Clock's setting didn't change from 2015, when it jumped two notches to three minutes before midnight — the closest it had been to midnight since the early era of above-ground hydrogen bomb testing. Created in 1947, the Doomsday Clock was conceived by scientists who had participated in the Manhattan Project. Initially seen as an indicator of the likelihood of disastrous nuclear conflict, it now also includes other threats, such as climate change, biological weapons and cyberthreats. It's the first time in the Doomsday Clock's 70-year history that the advisory board has adjusted the clock by 30 seconds. The decision to advance the clock was announced at the National Press Club, where speakers included board members former U.S. Ambassador to the United Nations Thomas R. Pickering and physicist Lawrence Krauss. A simultaneous event was held at Stanford University that featured California Gov. Jerry Brown, former Secretary of State George Schultz and former Defense Secretary William Perry. "Facts are stubborn things," Krauss said, "and they must be taken into account if the future of humanity is to be preserved." The Doomsday Clock, physicist Lawrence Krauss said at Thursday's event, offers "a rare opportunity to reach the global public directly." Urging members of the public to speak to their political leaders, he added that important decisions about humanity's future shouldn't be left to a few men. "President Trump and President Putin, who claim great respect for each other, can choose to act together as statesmen, or act as petulant children, risking our future," Krauss said. His direct comments sparked the first question after board members had made their initial statements, as Tracy Wilkinson of The Los Angeles Times asked Krauss, "You said this shouldn't be left in the hands of one or two leaders making crazy statements. I know you mean Trump, but is the second person Putin?" As Krauss answered yes, another panel member, Thomas Pickering, added, "Good guess."